Amateur Gardening has been informing and entertaining lovers of all things flora since 1884. Buy a single copy or subscription to Amateur Gardening magazine. 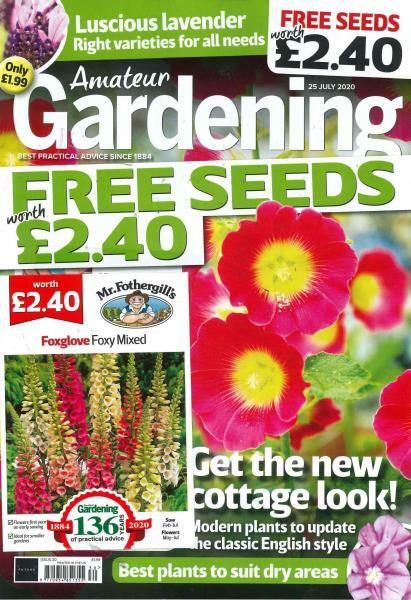 It is Britain's best-selling weekly gardening publication. Whether it's learning to plant, prune or till, Amateur Gardening is both novice and confident gardeners choose to read. A perennial award-winner in the field of horticulture, the magazine has been informing and entertaining lovers of all things flora since 1884. That's plenty of time to acquire all the knowledge one could possibly need to do with lawns, flowerbeds, herb patches and greenhouses. Whether you are a keen gardener or tending to your outdoor space for the first time, an subscription won't just help you keep your garden up with the Joneses, it will have you streets ahead. The easy-to-follow advice and accompanying imagery, make it almost impossible to go wrong. It's a great weekly magazine with plenty of short, appropriate articles.